What has been so fun about decorating this time around is that I can actually respond to her personality and likes, in addition to just doing what I want to do. 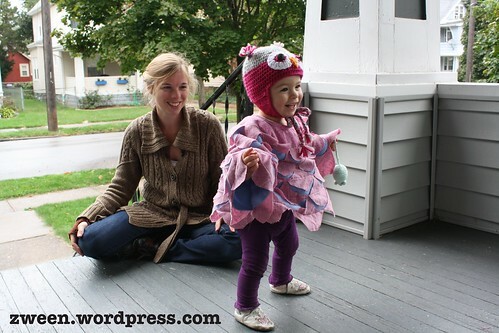 The fact is, our daughter, nearly three now (!) LOVES books. Ok, she’s a book-worm. So, I wanted to do some wall decor that reflected that. Normally, I would not “ruin” a perfectly good book for the sake of art, but I don’t believe I have done that here, mostly because it is actually the complete book up there on the wall, just in a different format. So without further ado, here is how I did it. First, I had to find two alphabet books that were identical (since of course the book is printed with letters on the front and back of each page). 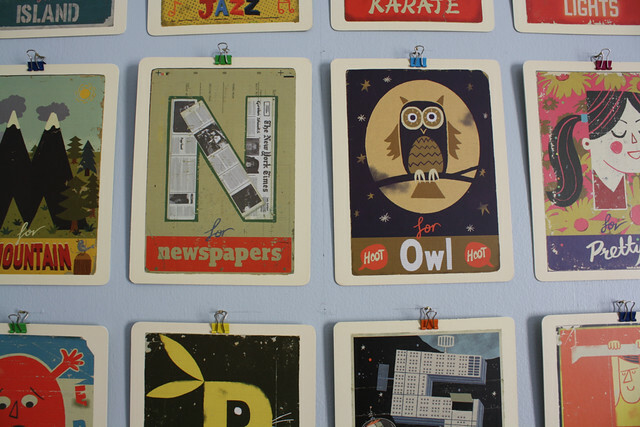 I really loved the illustrations in this book, called Paul Thurlby’s Alphabet. 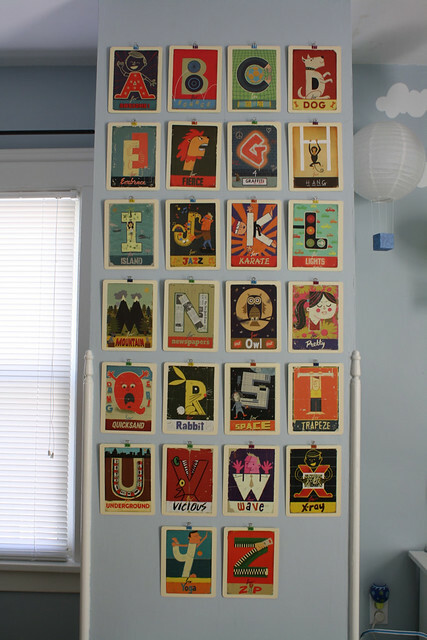 Honestly, these letters are so great it’s almost a shame NOT to hang them on the wall to enjoy all the time! I was really lucky to find both of my copies at a book sale run by my local library (for just 10 cents a piece!). They were booth canceled copies from the library’s collection, so they had already had a long life of enriching children. 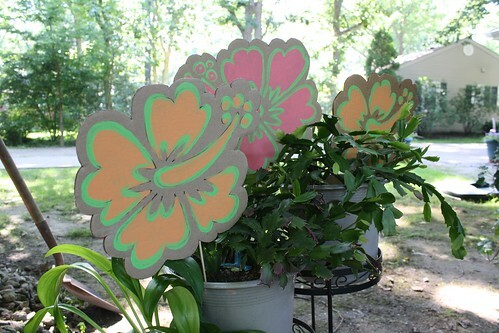 This is a board book, so the pages are made from a thick, card stock material, which is perfect for this application. Using an exacto knife, I very carefully cut each page from the binding. With a sharp knife this is not hard to do. Once I did that I had a page that had two nice rounded corners and two sharp 90 degree corners. To make the corners look uniform I just cut the sharp corners so that they matched the rounded ones then ran some fine grit sand paper across it give it a nice, finished, and smooth look. When it came to hanging the letters on the wall I knew I didn’t want to do any unnecessary damage to the pages by puncturing them with tacks or or by using tape, so I found some cute binder clips in a rainbow of colors and then hung those by the smallest nails I could find. 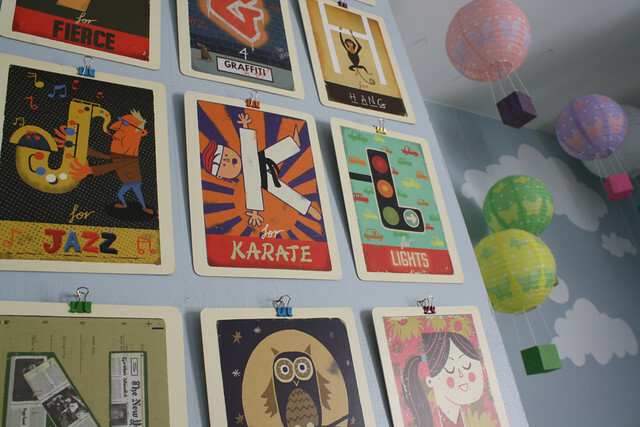 The hardest part of the entire project was actually putting them on the wall so that they were spaced evenly. Luckily, with the binder clips you have a little wiggle room in this area. It didn’t help that my wall is actually an inch wider at the top than it is at the bottom. I found it best to work from the center of the design to the outside and from top to bottom. In the close up photos you can see my registration lines. I still have to paint over these. 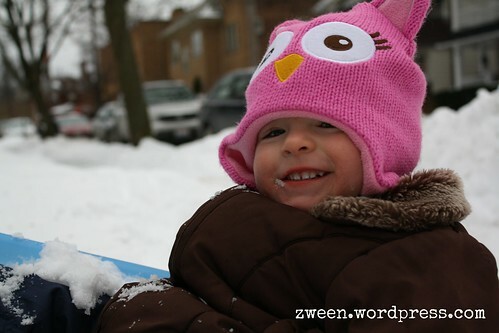 Over all I am so pleased with how this project turned out and my daughter is too! You can’t get any easier than this little DIY. 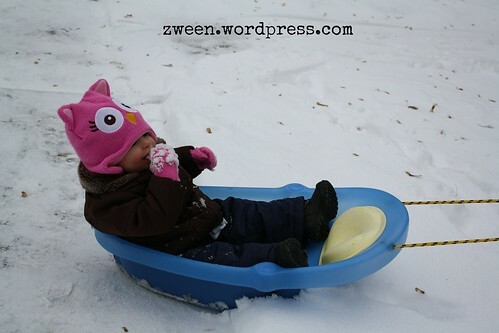 Really, this is just a thinly disguised excuse to share some pictures of my little cutie eating snow. But who doesn’t like to see cute baby pictures, right? All you need for this super simple DIY project is a baby bath tub, an electric drill, and some rope. The hard plastic is very easy to drill. 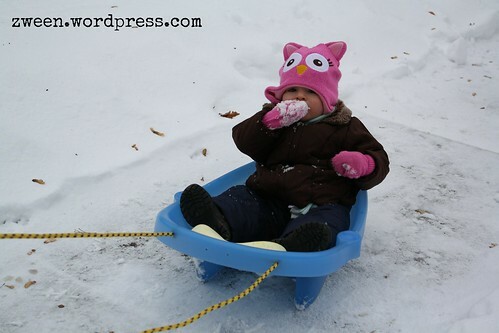 Once you have your holes, all you need to do is thread the rope and POW you’ve got yourself a tow-worthy sled (don’t get your hopes up about any hill action with this sled I’m afraid). 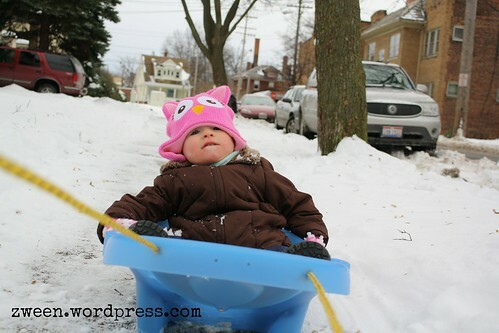 I will say that this sled works best on the sidewalk with just a thin layer of snow, but the thicker stuff is fun too, it just kept tipping over for us (much to the delight of our nearly 18-month-old daughter). 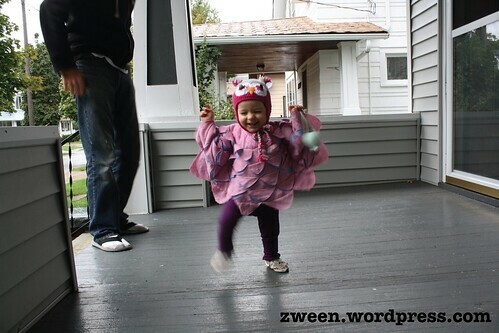 To keep up will all things zween (DIY projects, new plarn creations, baby pictures) like the zween facebook page! 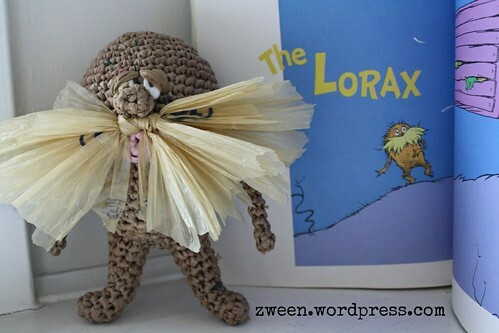 The Lorax has always been a story that has held a special place in my heart. 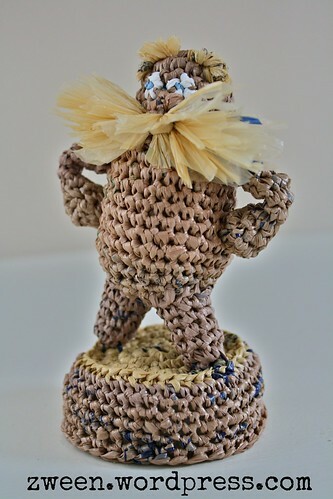 So here today I present my second attempt at bringing this scrappy character who is “shortish and oldish and brownish and mossy” to life in plarn (plastic yarn made from recycled grocery bags). 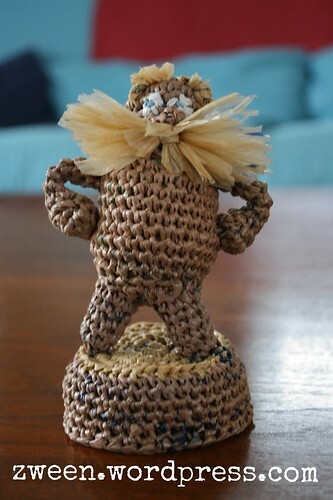 And since my first Lorax was sold at last years Last Minute Market, of course I needed a new mascot to accompany me this year as well! Both versions are original designs, as I used no pattern for either. The first one (below) was much larger than the second and based completely off the original illustrations by Dr Seuss. The second one (top) was based more off of the movie version, hence the more pronounced eye brows. The other differences between the two is that the current version is completely free-standing with its attached Truffula stump, and is also made of 100% recycled plastic bags (in the original design I used a foam material for the eyes). Come out and see me and the Lorax at this years Last Minute Market on December 21st and I will be happy to share with you my passion for recycling single-use plastic grocery bags into high-end handbags, change purses, drinking vessel carriers, and medicine bags. You really have to see my work to believe it. 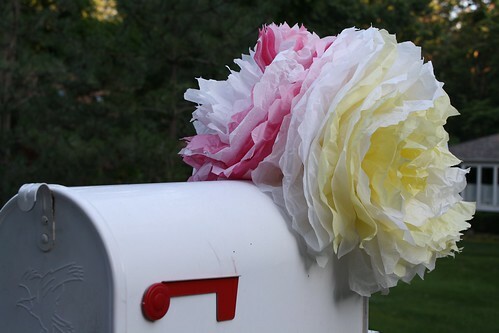 What could have been trash or downcycled material is turned into items of beauty and functionality. 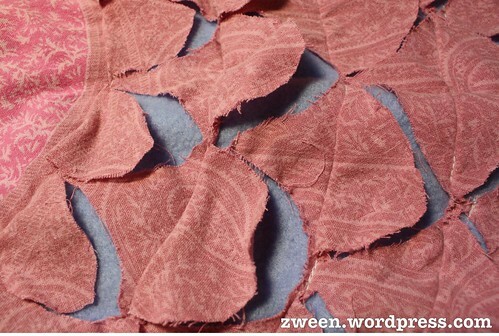 And don’t forget to like the zween Facebook Page, where I post all the latest news about what I’m up to! 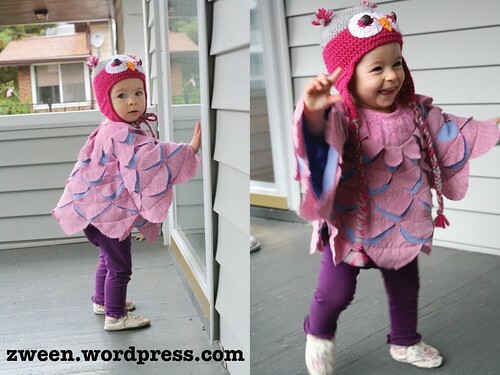 With Halloween less than two weeks away, you have plenty of time to whip up this cute owl costume for your little owlet! 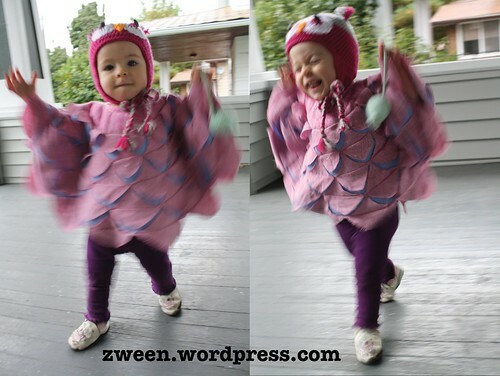 This costume is great for a toddler who is just starting to walk and still holds out their arms for balance, making it look like they’re flapping their wings! Virginia just started walking at the beginning of October so she’s definitely at this stage right now (as you can see!). 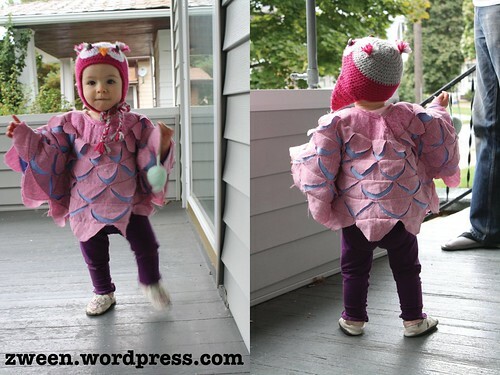 Why make an owl costume you ask? For over a month I’ve been trying to decide what Halloween costume to make for Virginia. Now that she’s 15 months old, and starting to show her own personality and interests, I thought I’d like to make her a costume to reflect something she seems to like at this point in her life. Right now she seems particularly drawn to all things outdoors, specifically leaves, trees, squirrels, birds, airplanes, flowers, and the moon. I’ve been collecting ideas on Pinterest, which is always a good starting point for inspiration, and found some cute ideas for trees, squirrels and owls. Then this past Sunday I just had the urge to get this project started! You know that feeling when you want to do something and you need to get it done NOW!? Yeah, that’s pretty much how I felt. At that point I was leaning toward making her a tree and incorporating a squirrel and a bird, kind of like this cute little costume from Probably Actually. But I also just wanted to start making something and didn’t want to go to the store. Does this ever happen to you? I get so frustrated going to the store! It seems like such a process these days and then I feel deflated because after all the time, effort, and money, I still don’t end up with what I really wanted. So I was determined to make something work from what I already had in my fabric stash. After digging around in the attic I settled on an old pink paisley cotton bed sheet that already had a number of chunks missing from other past projects, as well as a large remnant of blue fleece material I got for free at an Etsy event which I attended a few months back at the local fabric store, Stitch. At this point I had abandoned the adorable tree idea and started to think about this cute owl costume that I saw from Martin Family Times. 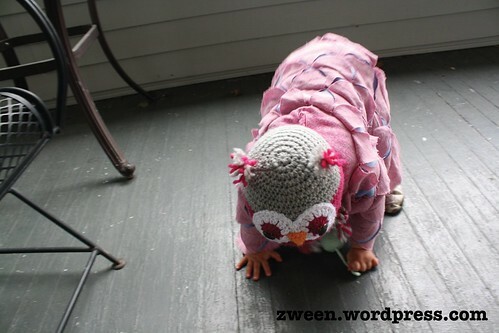 I figured I could make a new crocheted owl hat (I made one for Virginia last winter) from the Repeat Crafter Me free pattern instead of making one from fabric as shown in the above mentioned inspiration. Originally, I planned to make a cape of fabric feathers, similar to the inspiration, but I quickly changed my mind and went for a fitted poncho instead, mostly because I wanted something that she couldn’t easy take off! 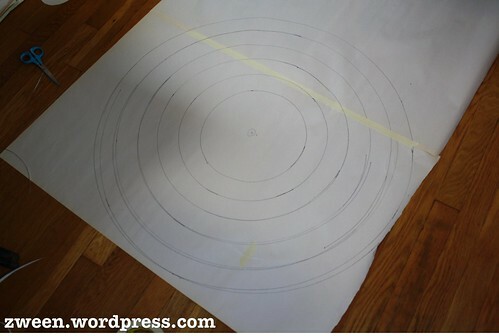 First I measured Virginia’s “wing span” (24 inches from wrist to wrist), which gave me the diameter for my foundation fabric (the blue fleece). I also figured out how big of a hole I needed for her head (about a 4.5 inch diameter circle in her case) then added a small slit to be able to put it over her head. 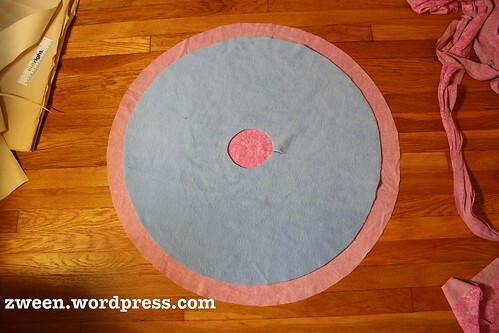 Next I cut a second circle 4 inches bigger than the first from the “feather fabric,” in this case a light weight cotton bed sheet. Now I took my paper pattern and folded it in half, than half again, and again, and again, etc, until I had a circle with evenly spaced segments to base my feathers off of. 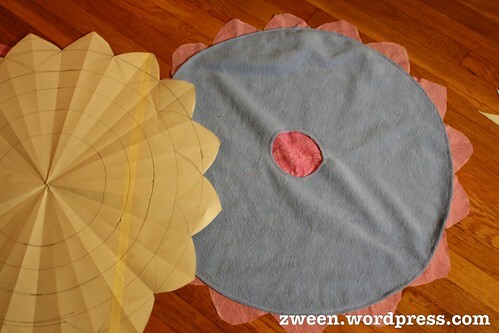 Next I sewed the two circles together along the inner circle (where her head goes) and the outer circle to hold everything in place and cut out the outermost row of feathers. 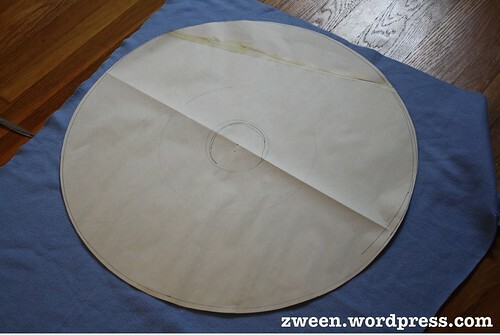 For each successive row, I cut my paper pattern 4 inches smaller in diameter, traced it onto the front of the costume using chalk, sewed along the chalk line, then cut the feathers out, staggering them over the previous row. To cut out the feathers while the fabric was sewn down, I used a pair of small, sharp scissors and was very careful not to cut through the foundation fabric. 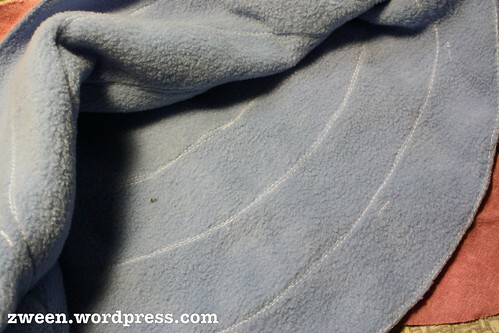 After the feathers were cut out, I flipped them up and sewed all the way around the row of feathers again very close to the edge of the fold, thus hiding the original line of stitching. This gave the feathers a little more “lift” and dimension. 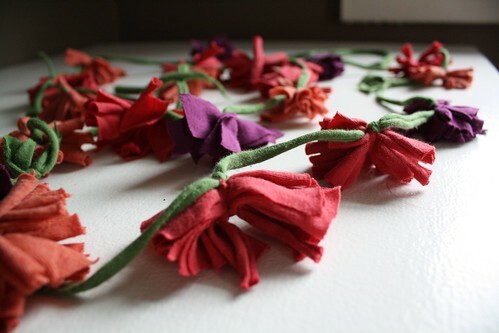 I like the way the raw, fraying edges of the fabric adds to its “featheriness” don’t you? Once the whole poncho was complete I sewed two vertical lines from the bottom up, leaving enough room for her arms, which created “sleeves” and also makes it nearly impossible for Virginia to remove it once it is on (HA!). To finish it off I created my very own bias tape for the neckline (which I sewed on inside out, oops!) and a single, sew-on snap secures the neckline in the back to give it snug fit. 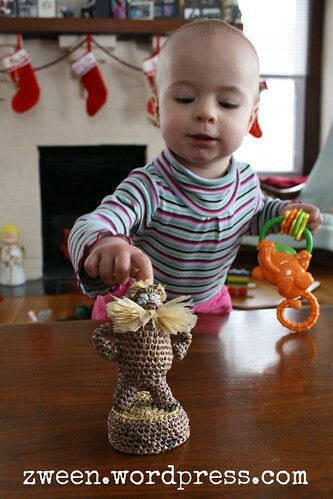 As mentioned above, the crochet owl hat pattern that I based Virginia’s hat on was originally by Repeat Crafter me, which is a WONDERFUL pattern all on its own. I’ve made this hat in several sizes following the pattern to the letter and they always turned out beautifully. But for this time I wanted to alter the pattern a bit to make it a bit warmer. To do this I first switched yarns (from 100% acrylic to 100% super wash Marino wool) and used a slightly bulkier yarn BUT kept the same size hook (H) so as to make a tighter stitch. In addition to using a bulkier yarn, I also worked the whole pattern in half double crochet instead of double crochet. Of course this meant that I had to add more rows. All in all I’m very happy with the way the hat turned out, even though the half double stitch shows the seam way more than when I did a double crochet stitch, but I can live with that. I couldn’t be a prouder owl momma! Keep up with all things zween make sure you like me on Facebook, where I update regularly about all things crochet, baby, thrifting, and upcycling! I hope that you’ve enjoyed this post! Happy crafting and happy Halloween! Today I am submitting my proposal to be a part of the Akron Mini Maker Faire on November 2, 2013. By transforming the ubiquitous plastic super market sack into chic and durable handbags, Emily Lindberg is diverting hundreds of plastic bags from landfills. 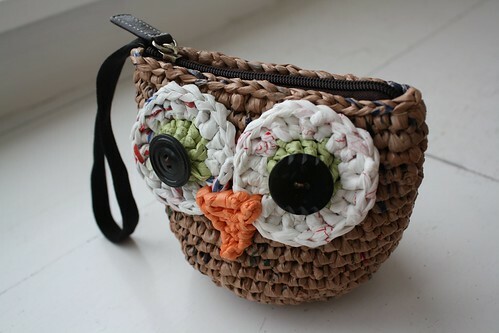 The Plarn Project; Plastic Bags Transformed, showcases these creations so as to inspire others to see the potential in what can be made out of trash. 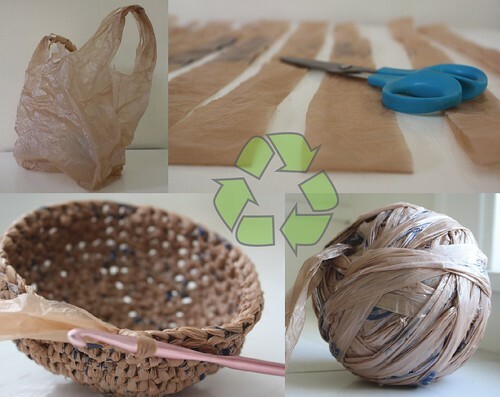 In addition to inspiration, the project educates the public about the stress that plastic bags place on our ecosystem, and Emily will be instructing willing participants how to create their own plastic yarn (plarn) out of 100% recycled material. 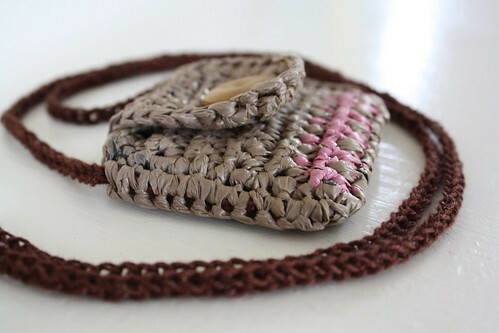 Along with actual examples of my most recent plarn creations, I will be providing key statistics and facts about the effect that plastic bags have had on our environment since their introduction in 1977. I will also be conducting ongoing demonstrations of plarn making for anyone who is interested and will have plenty of plastic bags on hand so that participants can make as much as they’d like! I hope that my proposal is accepted, and if it is, I hope that you can make it out to see me! Looks like I’ll be going to be a maker in the faire!!! So come on out to see me and all the other makers! Also, be sure to like my facebook page for updates on all things zween as well as reminders about the faire. See you soon! 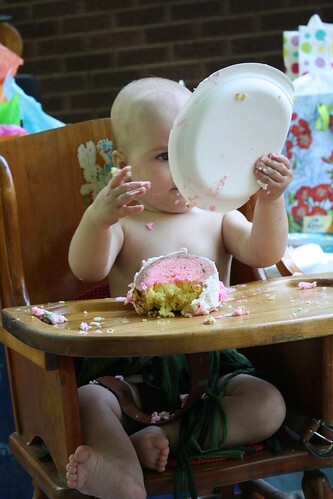 Happy 1st birthday to my baby girl Virginia! I can’t believe she is one year old today! To celebrate Virginia’s first year of life we decided to throw her a Luau. Why a luau you ask? Well, it is July, so it seemed appropriate enough, but actually there is a funny story as to how we came up with the idea in the first place. Back in February, when Virginia was just 7 months old, Jon bought a pineapple that sat ripening on our kitchen counter for several days. We decided that it would be a good idea to put the whole pineapple on Virginia’s high chair tray so that she could touch it and explore the interesting texture of the pineapple. Well, let’s just say she was a little apprehensive of this strange and poky fruit. She didn’t cry or anything, just pulled her hands in toward her chest whenever the fruit got too near. We have it on video and it’s one of my all time favorites. 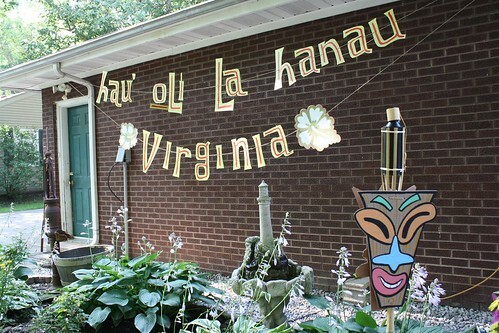 Afterwords I joked to Jon that we should throw Virginia a Luau for her 1sth birthday. 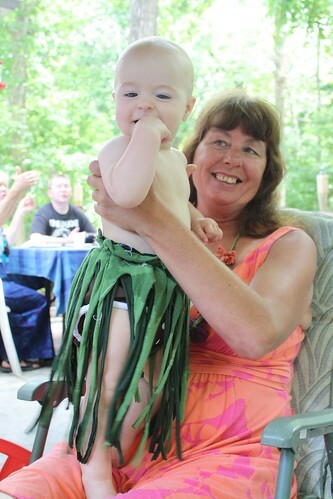 After the seed was planted I just couldn’t get the idea out of my head, it just seemed like she was meant to have a Luau birthday, and here we are! 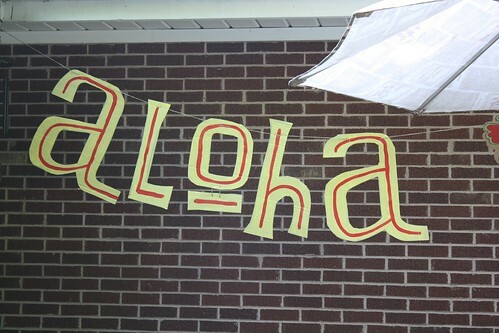 Of course we couldn’t just buy a few tiki torches, plastic leis, grass skirts, have a pig roast, and call it a day! 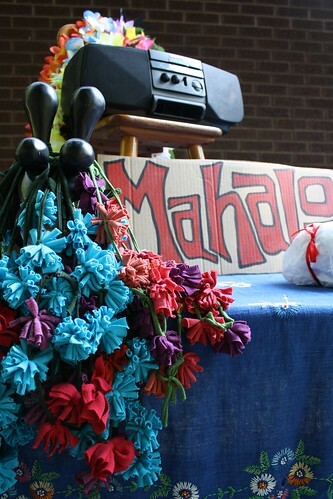 Read on to see how we transformed ordinary cardboard boxes, t-shirts, and produce into some pretty neat Luau decor. 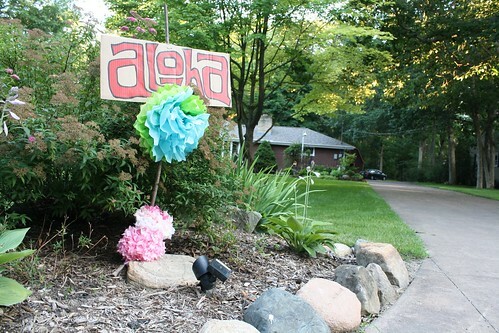 I credit many of my ideas to Pinterest, where I got so much of my inspiration (see my luau pinterest board here), my husband for his amazing aptitude for drawing tiki masks and hibiscus flowers (he’s spent many hours painting signs for Trader Joe’s), and my mom awesome cake decorating abilities! I first want to mention that this was a lot of work. A LOT. But it was worth it. Just keep that mind that if you want to recreate some of the decorations that we have made, you will need a lot of time, or a lot of hands, to get it done. 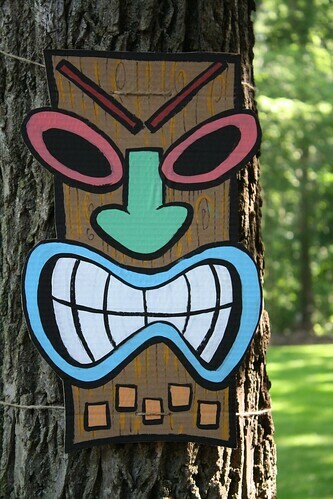 So although this is a great recourse for people who want to throw their own DIY luau, it is not for the procrastinations out there. Sorry. First thing’s first, when going to a party, any party, you have to know where it is. 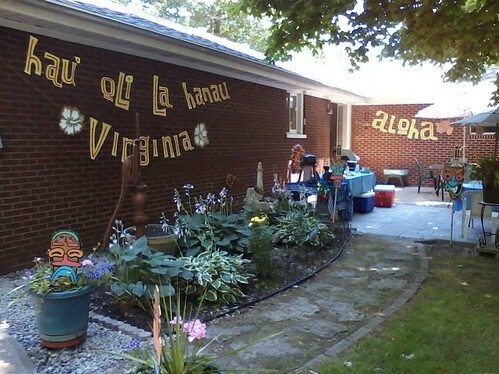 We threw the luau in my parent’s back yard (actually, on their newly finished patio!) and while many guests had been there before, some had not and I wanted to not only set a festive mood, but make it obvious as to where the party was happening. 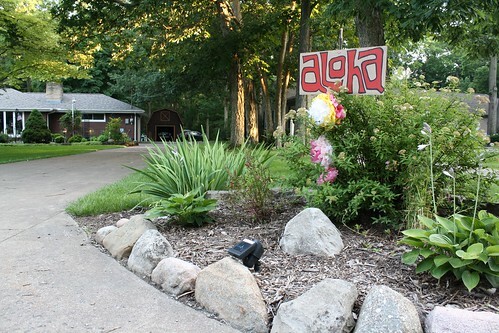 Balloons on the mailbox are an obvious choice, but in this situation I thought tissue paper flowers (made out of recycled tissue paper from Virginia’s baby shower and originally used as decor in her first nursery) and hand-painted aloha signs on either side of the driveway were more appropriate. The above photo is by Mary Norgard, Virginia’s lovely Great Aunt! Jon gets full credit for making and hanging the signs. 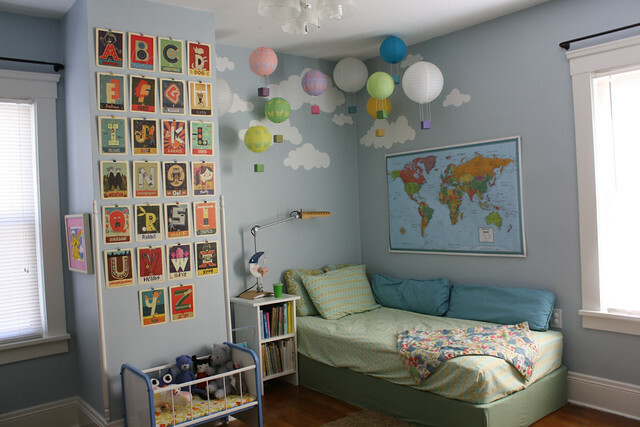 Each letter was hand-drawn on cardboard, cut out, painted with acrylic paint, and then strung together with twine. 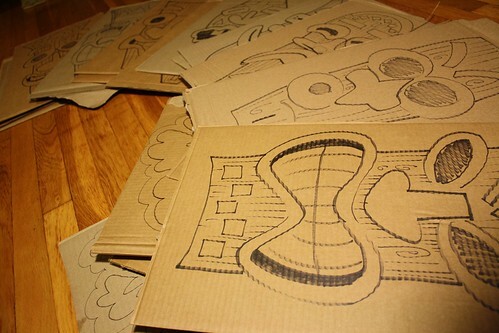 I’d also like to mention that all of our cardboard decorations were made using recycled cardboard from Trader Joe’s (actually they are twice recycled, because before we used them for decorations we made a box maze for Virginia with them a few weeks ago!). 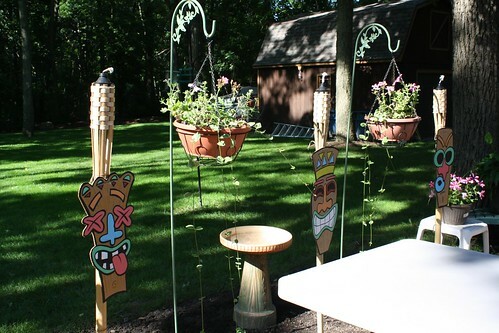 Hand-painted tiki masks were tied to tiki torches and trees, while hibiscus flowers were placed in potted flowers, hung from umbrellas, and tied to the legs of Virginia’s high chair. 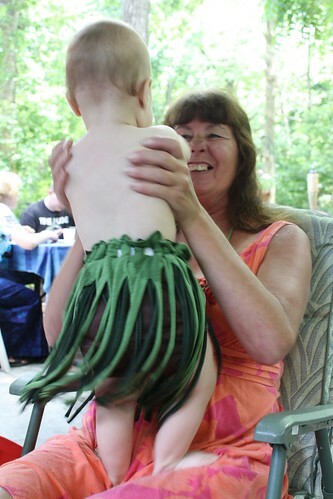 I used two green recycled t-shirts and some elastic to create Virginia’s grass skirt. It was VERY easy to make. 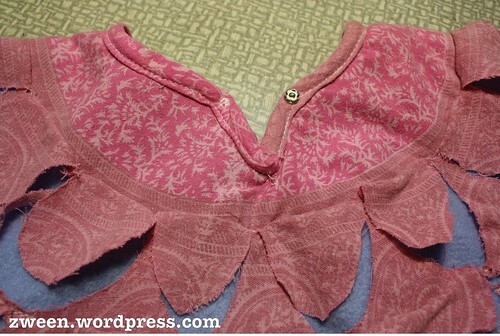 To make one yourself cut a shirt horizontally underneath the arms. Using the bottom tube that remains, cut the shirt in 1.5 inch strips from top to bottom, stopping each cut about 2 inches from the bottom hem. That will become the top of your skirt. Repeat this process with a second shirt. Put shirt inside of the other and cut slits into both every 4 inches or so. 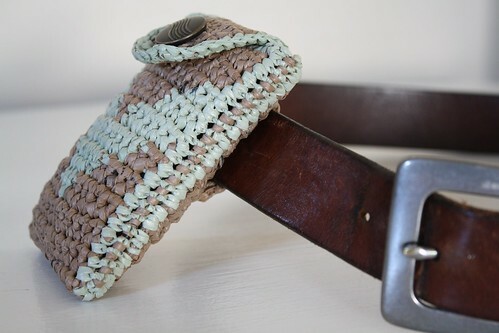 Weave your elastic through the holes and sew the elastic to itself, creating the waist band. 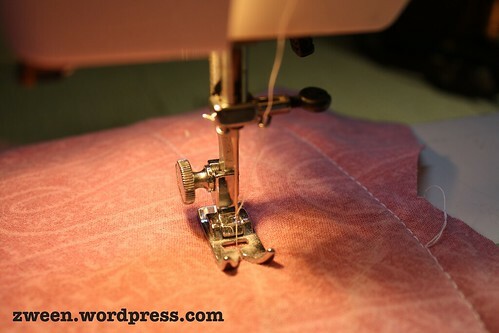 Trim the skirt to desired length. I showed my mom Virginia’s skirt earlier in the week and she decided to make one for Virginia’s older cousin. I really liked how they both turned out! 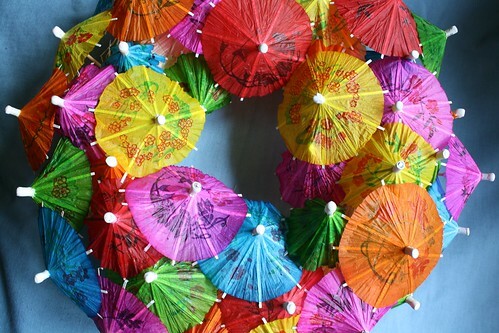 A wreath made from several paper drink umbrellas stuck into one of those packed-straw wreath forms from the craft store was a fun little project and another one that was Pinterest-inspired. 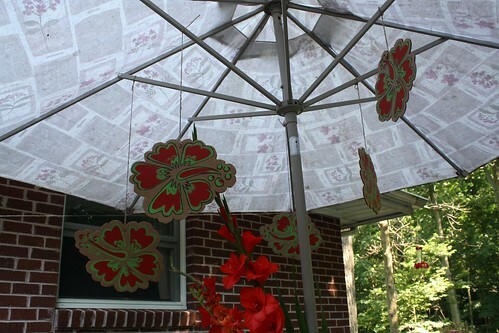 I thought it was a cute idea, but when I saw a box of over 100 of those tiny umbrellas for only $1 at a church rummage sale last weekend, I had to make one myself. 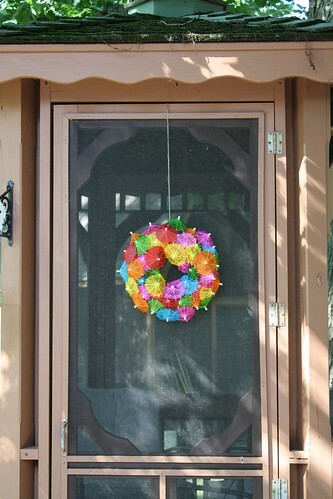 I wasn’t really sure where I’d end up putting it, but the gazebos door seemed to be as good a place as any. 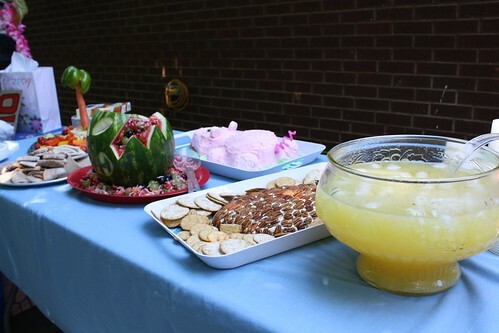 And what would a party be without food? We were a little ambitious with some of our food choices, as a lot of the things were a bit labor intensive but had to be done kind of at the last-minute. 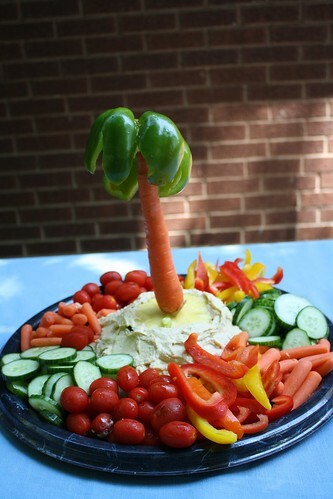 We had a veggie tray, complete with palm tree made from a carrot and bell pepper sitting on an island of humus. 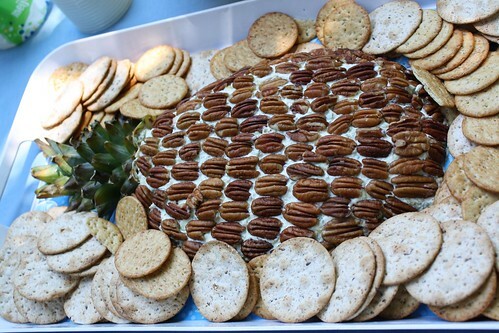 A pineapple cream cheese spread that looked like a pineapple. 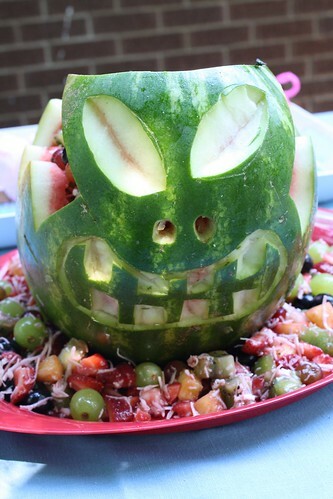 A fruit salad in a watermelon bowl cut like a tiki mask. To drink we had a pineapple, lemonade punch and the main course was Hawaiian ham and veggie kababs. 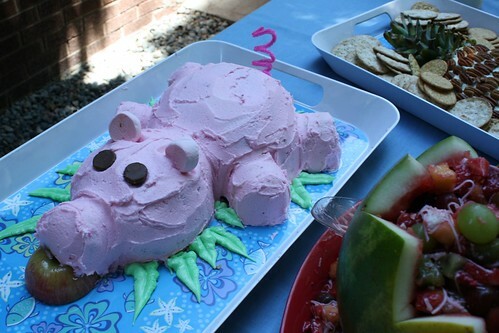 Finally, the cake, made by my mother, was in the shape of a roasted pig and came out fabulous (both in looks and in taste)! 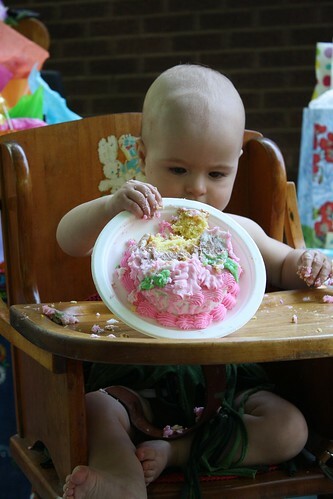 My Mom also made a “smash cake,” which Virginia throughly enjoyed of course. 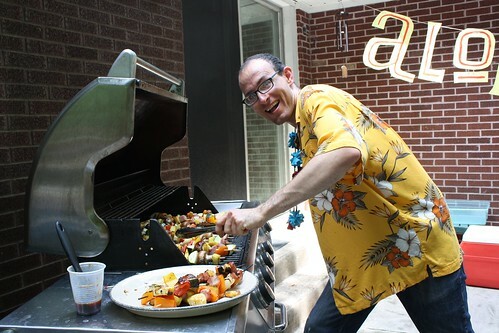 I can’t wait to have more luaus in the future! **This post has just been added to the Make it Pretty Monday link party over on the Dedicated house, MWC Mondays on Making the World Cuer, and Motivate Me Monday on Keeping it Simple! 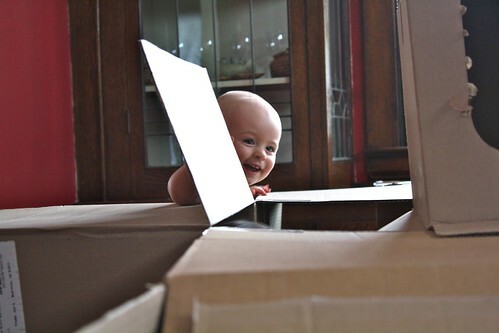 If you are a parent, but even if you’re not, you’ve probably heard the age-old adage that a child will enjoy playing with the box that a toy comes in more than the toy itself. Today I’d like to share some photos of a little family craft project (well, not so little actually) that we started one rainy, dreary morning this week. It’s a giant maze made from recycled cardboard boxes that encompasses our entire dining room (I knew there was a reason we’ve been dragging our feet finding a dining room table). All you need is several cardboard boxes (ours were complements of Trader Joe’s, thanks to my husband, our insider connection) and some packing tape or even duct tape. Just fit the boxes together in whatever configuration you like and tape them together where needed to keep the structure stable. Virginia is just a couple of weeks from her first birthday now (!!!!) and isn’t yet walking. 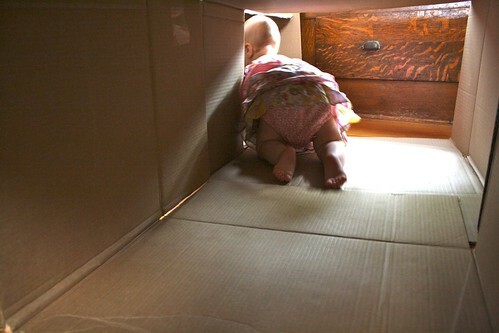 She LOVES crawling around this maze. We’ve had it up for about four days now and it’s been good for HOURS of entertainment! She just loves to chase momma around the maze and be chased herself! Papa got in on the action too of course, but at over six feet tall, he had some maneuverability issues. 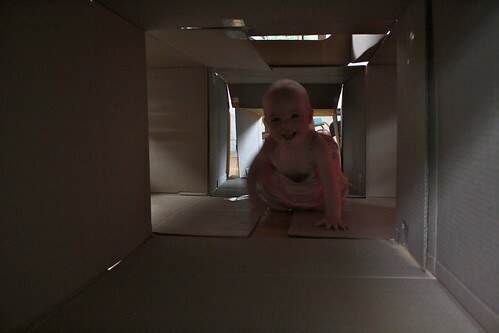 By the way, as an adult, army crawling through a cardboard maze is quite the workout! Sometimes we mix it up and place rattles, balls, and other small toys around the maze for her to find, but mostly she’s content to crawl in and out, squealing in delight all the way. 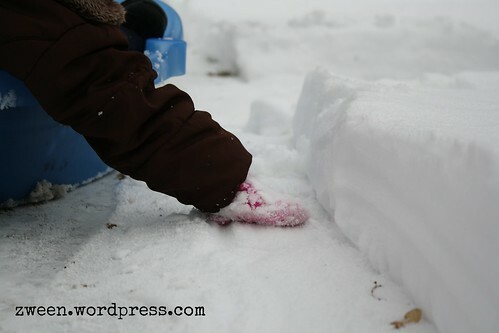 This is a great project for those days when you just can’t get out and I’m sure would work great with older kids as well. 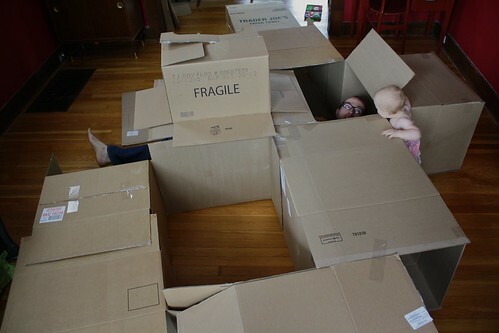 If this post has inspired you to create your own box maze I’d love to hear about it! 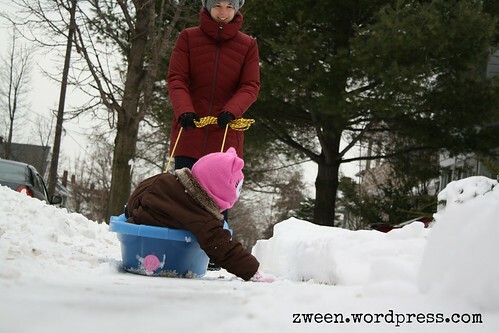 Write about it in the comments below or on the zween facebook page. Happy crafting!